Approximately 10 per cent of those with German origins still speak or understand German – including celebrities like Sandra Bullock, Henry Kissinger and Leonardo DiCaprio. 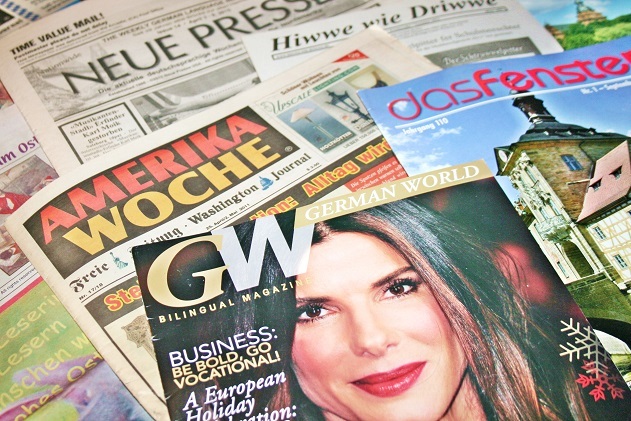 In the U.S., these roughly five million people are targeted by a strong German-language media presence composed of over 100 newspapers, magazines, community newsletters and bulletins, as well as around 100 local radio programs and roughly 20 local television broadcasts. It’s also worth noting that, worldwide, the U.S. have the oldest weekly German-language newspapers, beginning with the “New Yorker Staats-Zeitung”, which began publication in 1834. At first, this newspaper was one of the biggest in the U.S. Almost as old as the New York paper is Michigan’s 1854-founded “Nordamerikanische Wochen-Post”. “The Saxon News – Volksblatt”, founded by Cleveland’s Allianz der Siebenbürger Sachsen, and “Eintracht”, the weekly paper out of greater Chicago, were founded not long ago: they were launched in 1902 and 1922, respectively. The tradition-rich “Eintracht” primarily targets the many German-Americans living in the northwestern U.S. Its importance has attracted interviews with numerous outstanding people, including Konrad Adenauer, Willy Brandt, rocket pioneer von Braun, national soccer coach Sepp Herberger and four U.S. presidents. Among the newspaper scene’s true newbies are the East Coast-based “Amerika-Woche” and California’s “Neue Presse”, both founded in the second half of the 20th century. “Amerika-Woche” is one of the biggest publications – especially since its merger with the “Freien Zeitung” (founded 1858) and the “Washington Journal” (1859) in the late 1990s. Noteworthy magazines include “German World” (founded 2002), targeted toward young German speakers and language learners, the colorful women’s magazine “Das Fenster” out of Georgia (1904) and the widely circulated tourism magazine “Florida Sun” (1999). These contemporary designed publications highlight how lively and promising the American German-language media market can be.